The Institute of Contemporary Development has published its most recent analytical bulletin. The main topics of this issue are: Russia’s image abroad, cooperation between Russia and Latvia, the perspectives of the Asian economy, Chinese investment activities in the European Union. 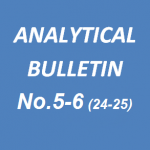 The annotation of Analytical Bulletin No.3 (34) can be found bellow. The full text of the bulletin in Russian can be found here. The Institute of Contemporary Development has published its most recent analytical bulletin. The main topics of this issue are: the meeting in the “Normandy format” in Minsk, Munich Security Conference, the new Report of the Trilateral Commission regarding Russia, agendas of the structural reforms of the world leading economies. 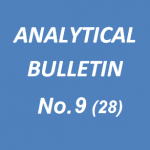 The annotation of Analytical Bulletin No.2 (33), can be found bellow. The full text of the bulletin in Russian can be found here. The Institute of Contemporary Development has published its most recent analytical bulletin. The Institute of Contemporary Development has published its most recent analytical bulletin. The main topics of this issue are: the Trilateral Commission on the Ukrainian Crisis and future of the EU; the formation of the Transatlantic and Transpacific Partnerships; European security yesterday and today; the current state of the global economy; trends and forecasts for oil prices. 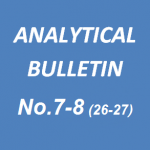 The annotation of Analytical Bulletin No. 10 (29), can be found below. The full text of the bulletin in Russian can be found here. The Institute of Contemporary Development has published its most recent analytical bulletin. The main topics of this issue are: the participation of Russia and Western countries in the settlement of the Ukrainian crisis; new challenges to global security and Russia’s role in global institutions; the Russian financial sector and the impact of sanctions. The annotation of Analytical Bulletin No. 9 (28), can be found below. The full text of the bulletin in Russian can be found here. The Institute of Contemporary Development has published its most recent analytical bulletin. The main topics of this issue are: the sanctions war, results of the BRICS summit, and the IMF on the prospects for the global economy. The annotation of Analytical Bulletin No. 7/8 (26/27), can be found below. The full text of the bulletin in Russian can be found here. This report represents the first part of a project targeting the problems and prospects of two economic integration projects in Greater Europe — the European project (European Union) and the Eurasian project (Russia, the Customs Union and the Eurasian Economic Union). The presented study pays particular attention to the EU’s Eastern Partnership, Ukraine’s gains and losses stemming from its internal crisis and implications of its “European choice”, and the implications of this choice for Moldova. The aggregate results and calculations as well as the underlying methodologies are substantiated in the full text of the report, which is available in Russian. The Institute of Contemporary Development has published its most recent analytical bulletin. The main topics of this issue are: the dead end in the integration struggle in Europe; the Russian economy’s turn to the east; the current and future prospects of NATO; global health security; foreign policy and public opinion in Germany. 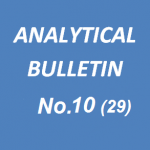 The annotation of Analytical Bulletin No. 5/6 (24/25) can be found below. The full text of the bulletin in Russian can be found here.